The Climate Model Development and Validation-Regionally Refined Meshes (CMDV-RRM) focuses on enhancing the representation of clouds and convection in the DOE’s Accelerated Climate Modeling for Energy (ACME) model using regionally refined meshes (RRM). Clouds continue to be one of the largest sources of uncertainty in climate models. Clouds are also central to the scientific objective motivating ACME, especially as they relate to how the hydrological cycle and water resources interact with the climate system on regional to global scales. Reducing uncertainties from clouds and improving regional simulation skill requires both higher resolution and improved physical parameterizations of clouds. ACME is pushing the limits of horizontal resolution in climate models: ACME version 1 (v1) is targeting a globally uniform horizontal resolution of 25 kilometer (km), with even higher resolution planned for subsequent versions. Therefore, ACME is entering the “grey zone”: a range where the resolution is (1) too high for traditional cloud and convective parameterizations, but (2) too coarse to rely solely on parameterizations found in explicit high-resolution models such as large eddy simulations (LES). The goal of this project is to evaluate the treatment of clouds and convection in ACME at resolutions that fall within the grey zone using ACME with regionally refined meshes (RRM), LES simulations, and new ARM derived datasets. The validation efforts of the project will target any relevant version of ACME (v1, development versions, or configurations with new parameterizations from other projects as they become available). Simulations will be run both at globally uniform resolution (100 km, 25 km) and at using the regionally refined meshes spanning a range og resolutions (100- > 25 km or finer). 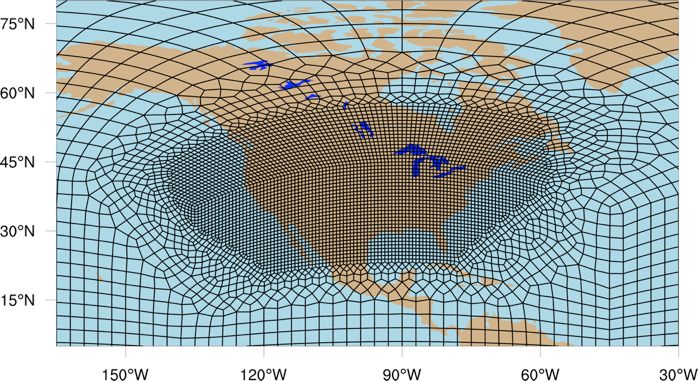 RRM grids will be constructed to target regions rich in Atmospheric Radiation Measurement (ARM) Climate Research Facility observations, including the Southern Great Plains (SGP), Eastern North Atlantic (ENA), and Tropical Western Pacific (TWP, i.e., Darwin) atmospheric observatories. New data sets, including 3-dimensional gridded ARM constrained variational analysis (VAR) data sets and radar derived cloud and precipitation startistics will be developed from ARM and other related observations at the various sites. By design, the selected regions cover a wide range of cloud regimes, thus providing the opportunity to validate ACME for many regimes. Develop RRM framework for ACME focusing on SGP, ENA, and TWP regions. Perform and validate ACME-RRM simulations over these three regions. Develop new ARM/ASR related data sets and tools targeted at evaluating ACME. The above figure summarizes the interaction between these objectives. Objective 1 will focus on the development of ACME RRM framework for SGP, ENA, and TWP. 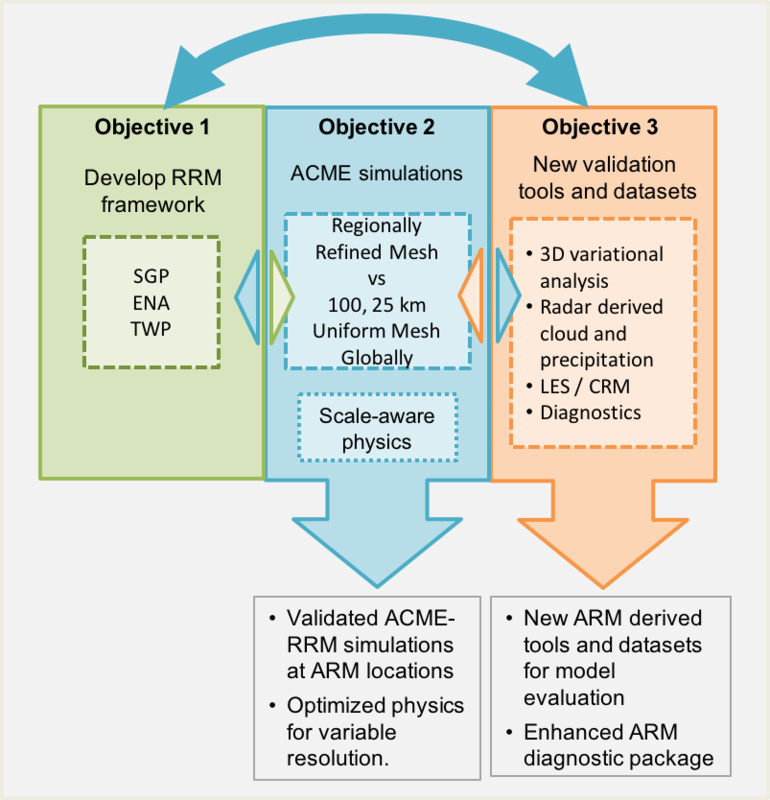 Objective 2 will validate ACME-RRM against observations as well as compare RRM simulations to ACME simulations with globally uniform resolution (100 or 25 km). Objective 2 will also evaluate the sensitivity of ACME cloud physics to resolution (scale-awareness) and investigate possible avenues for reducing grid sensitivity. Objective 3 provides new, ARM/ASR data sets, high-resolution modeling output, and cloud modeling and diagnostic tools that will be used to support the validation in Objective 2. These tools include large-eddy simulation (LES) for deep convection and enhanced ARM process-oriented diagnostic package for ACME. The data sets and tools developed in Objective 3 will also be made available for the community to validating any climate simulation system. Summary of the main project objectives and deliverables is provided.